Animal manures contain many different pathogens that can pose health threats to animals and humans. Managing manures in a biosecure manner can prevent and reduce the possibility of spreading diseases that can be found in manures. The three factors required to cause an infection are infectious agents, mode of transportation and a susceptible host. Animals and manures can act as a pathogen’s host. Hauling cattle and people traveling to different animal facilities are two modes of transportation (Helm, 2006). If a link in this infectious chain is broken, no infection can occur. Infectious agents always will exist, but they are reduced with proper veterinary practices, sound biosecurity and good animal husbandry. More than 150 pathogens excreted by animals can cause illnesses to humans (Table 1). Manure excreta can contain 10 billion cells per milliliter. Some infections can be caused by as few as 10 cells of certain pathogens (Pell, 1997). A study conducted by Hancock et al., (1997) found 1.41 percent of 12,664 dairy manure samples tested positive during a six-month period for E. coli O157. However, the majority of manure management systems can reduce manure microbe concentrations in excess of 99 percent (Ziemer et al., 2010). Table 1. Various infectious pathogens found in cattle manures. Pathogen survival is dependent on manure type, pH (acidity or alkalinity), dry-matter content, temperature, number of pathogens present and competing organisms. Factors such as sunlight, low or high pH, drying and high temperature reduce the survival of pathogens (Kirk, 2011). Due to high temperatures (in excess of 130 F), composting manure has been found to kill pathogens (Grewal, 2006). Refer to NDSU Extension publication NM1478, “Composting Animal Manures: A guide to the process and management of animal manure compost,” for more information on composting manure. Cleaning pens regularly is a practice that often is overlooked but has many benefits. Benefits include reduced odor, improved drainage, reduced mud/manure on hides and pathogen removal. Dry pens tend to emit fewer odors than wet or muddy pens. Pen odor emissions have been found to increase up to 60 times under wet conditions (Watts et al., 1994). Fresh manure odors tend to be minor compared with aged manures (Miller and Varel, 2001). Excess manure can act as a dam, preventing water from running off into a containment pond, leading to muddy conditions. Mud increases stress on cattle. As little as 6 inches of mud can reduce feed intake by 10 percent, and 12 inches of mud can reduce feed intake by 15 percent. This can lead to reduced daily gains (National Research Council, 1981). Pathogens also are more likely to survive longer under wet conditions. Muddy pens create a situation where pathogens are more likely to transfer from feces to animals’ mouths (Smith et al., 2001). Regular pen cleaning also has been found to conserve manure nitrogen. Cleaning pens monthly, instead of at the end of a feeding period, has been found to decrease nitrogen losses (Wilson, et al., 2004). Pens at or near their carrying capacity may need to be cleaned as frequently as every 10 days. Pens can be cleaned with a push/pull blade, bucket tractor or box scraper. Pull-type implements work well and are less likely to cause damage to a pen’s surface than a push-type implement. Push-type front-end implements are more prone to scar and gouge a pen’s surface. This can make a surface uneven and reduce the surface’s water-shedding properties (Auvermann, 2001). Manure needs to be piled in an area where leachates will drain to the containment pond. Cleaning the equipment, including implement tires, after the pen has been cleaned is important. Animal mortalities may host a harmful pathogen, and not managing the dead animals promptly can lead to adverse health effects to humans and animals. According to North Dakota Century Code 36-14-19, an animal found dead is to be assumed that it died from a contagious or infectious disease until the cause of death has been determined. The carcass must be managed within 36 hours (state of North Dakota, 2009). Approved animal carcass management practices include burning, composting, burying or rendering. For more information on these practices, consult NDSU Extension publication NM1422, “Animal Carcass Disposal Options.” Equipment and clothing used to manage animal mortalities need to be cleaned and sanitized after use. Pathogens can spread easily through many different ways. Some of these include clothing that’s not cleaned before being worn at different facilities, manure spreaders that are used at different operations without being cleared between uses and pests. Eliminating a pathogen’s mode of transportation prevents its spread to another facility. Livestock facilities have visitors throughout the year. Therefore, a producer should keep a visitor log to aid in pinpointing the pathogen’s source in case an outbreak occurs. Visitors should park their vehicles only in a designated area away from the animals. Visitors should wear clean clothing and disinfect their footwear when entering and leaving a facility or wear disposable protective boot liners. Visitors also should wash their clothes as soon as they arrive home. Manure spreaders, compost turners and loaders usually come close to animals and have direct contact with manure. Special care and cleaning of the manure handling equipment is a must. Beware of cross-contamination as well. Equipment used to handle feed must be cleaned and disinfected if also used for manure handling. For example, if an end loader handles feed and is used infrequently to scrape a pen, the bucket and tires of the end loader need to be cleaned and disinfected thoroughly before handling feed again. Manure needs to be applied at agronomic rates and at least 100 feet away from surface waters unless a 35-foot-wide vegetated buffer strip is between the application area and the water. This prevents nutrient runoff from polluting surface waters (North Dakota Department of Health, 2005). Vegetated buffer strips and applying manure away from surface waters also prevent pathogens from reaching surface water and causing infections to humans and animals that use the water body (Larsen et al., 1994). Cleaning and removing material from the equipment is 90 percent of the job, while disinfecting is only 10 percent for proper equipment sanitizing (Helm, 2006). 1. 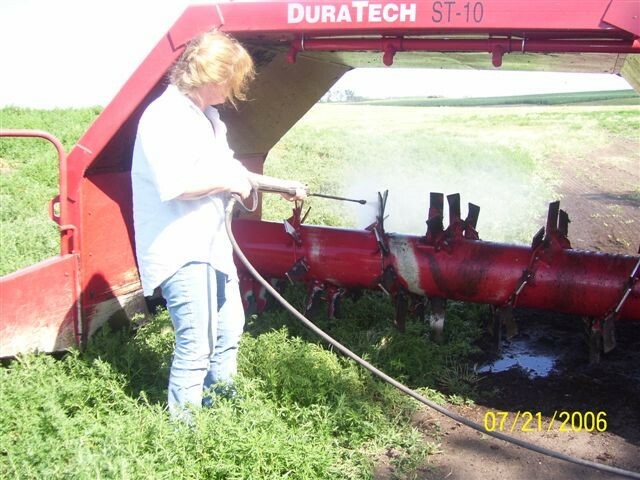 Clean the equipment in a designated area away from the livestock. 2. Remove organic matter because it can serve as an infection reservoir (Figure 2). 3. Power-wash the equipment (Figure 3). Hot water and detergents assist with the initial cleaning. 4. Scrub tight areas with a stiff hard-bristled brush. 5. Allow the equipment to dry before disinfecting. Wet equipment can dilute the disinfectant. 6. Disinfect the equipment. Following the instructions on the product label is very important. Table 2 provides information on various disinfecting products. 7. Allow the equipment to dry. Figure 1. 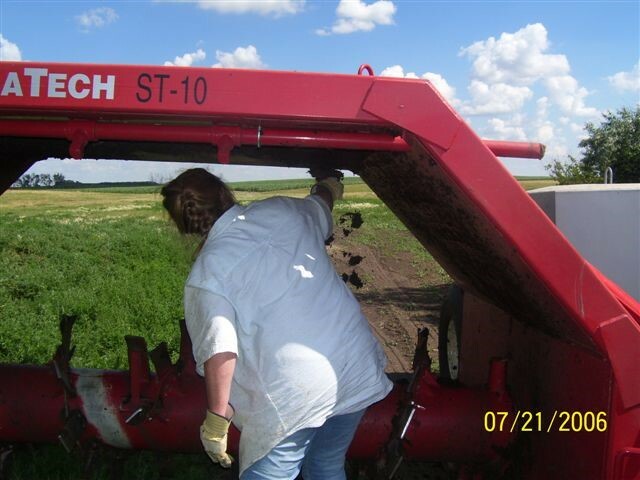 Cleaning a feedlot pen with a pull-type box scraper. Figure 2. Removing organic matter from a compost turner. Figure 3. Initial power-washing of a compost turner. Table 2. 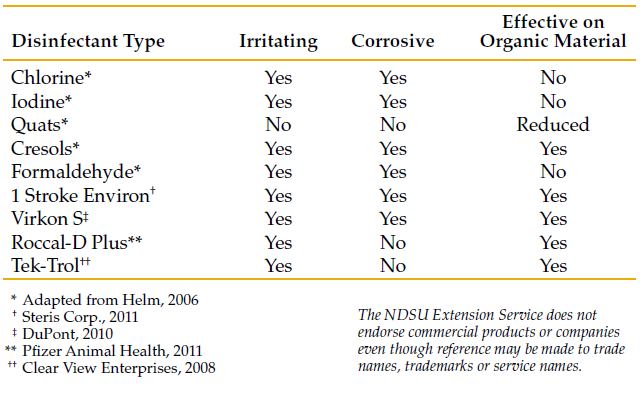 Various disinfecting agents and their selected traits. The NDSU Extension Service does not endorse commercial products or companies even though reference may be made to trade names, trademarks or service names. Washing the equipment prior to entering and leaving a facility is the best preventative measure. At the very least, the equipment should be washed prior to leaving the facility. This also will reduce the equipment’s odor and prevent pieces of manure from being deposited on roads. Clothing worn while handling manure and animal carcasses can be contaminated with and transport pathogens, so it needs to be washed properly. Washing clothes with detergent and drying them at 140 F will kill harmful pathogens. Footwear needs to be cleaned with soap and water followed by a disinfection regime. A mixture of 5 tablespoons of bleach per gallon of water works well for disinfecting footwear (Helm, 2006). The threat of pathogen outbreaks can be reduced greatly by thoroughly cleaning manure-handling equipment and clothing after each use by following the label of the cleaning product used. Animal carcasses can harbor many pathogens and need to be managed quickly and effectively. Cleaning pens frequently lessens odors and harmful pathogen longevity. This also preserves manure nitrogen that can be used as crop fertilizer. Pathogens always will pose a threat to animal and human health. However, implementing sound, biosecure management practices can decrease pathogenic threats to human and animal health greatly. Auvermann, B. 2001. Lesson 42: Controlling dust and odor from open lot livestock facilities. MidWest Plan Service, Iowa State University, Ames, Iowa. Clear View Enterprises. 2008. Tek-Trol Label. Verified Feb. 1, 2011. DuPont Global. 2010. DuPont Global website. Verified Feb. 1, 2011. Grewal, S.K., S. Rajeev, S. Sreevatsan and F.C. Micheal Jr. 2006. Persistence of Mycobacterium avium subsp. Paratuberculosis and other zoonotic pathogens during simulated composting, manure packing and liquid storage of dairy manure. J. Vet Diagn. Invest. 18:529-535. Hancock, D.D., D.H. Rice, D.E. Herriott, T.E. Besser, E.D. Ebel and L.V. Carpenter. 1997. Effects of farm manure-handling practices on Escherichia coli O157 prevalence in cattle. J. Food Protect. 60:363-366. Helm, J.D. 2006. Biosecurity: Protecting animal agriculture. Verified Jan. 31, 2011. Clemson University, Columbia, S.C.
Kirk, J.H. 2011. Pathogens in manure. Verified Jan. 31, 2011. University of California Davis, Tulare, Calif.
Larsen, R.E., J.R. Miner, J.C. Buckhouse and J.A. Moore. 1994. Water-quality benefits of having cattle manure deposited away from streams. Bioresour. Technol. 48:113-118. Miller, D.N., and V.H. Varel. 2001. In-vitro study of the biochemical origin and production limits of odorous compounds in cattle feedlots. J. Anim. Sci. 79:2949-2956. National Research Council. 1981. Effect of environment on nutrient requirements of domestic animals. pg. 59-74. National Academy Press, Washington, D.C.
North Dakota Department of Health. 2005. North Dakota livestock program design manual. North Dakota Department of Health Environmental Health Section, Division of Water Quality, Bismarck, N.D.
Pell, A.N. 1997. Manure and microbes: Public and animal health problem? J. Dairy Sci. 80:2673-2681. Pfizer. 2011. Pfizer Animal Health . Verified Feb. 1, 2011. State of North Dakota. 2009. North Dakota Century Code chapter 36-14, contagious and infectious diseases generally. Verified Feb. 2, 2011. < North Dakota state government, Bismarck, N.D.
Steris Corp.. 2011. Steris Life Sciences. www.sterislifesciences.com/Products/Surface-Disinfectants/Disinfectants/1-Stroke-Environ-Germicidal-Detergent.aspx. Verified Feb. 1, 2011. Smith, D., M. Blackford, S. Younts, R. Moxley, J. Gray, L. Hungerford, T. Milton and T. Klopfenstein. 2001. Ecological relationships between the prevalence of cattle shedding Escherichia coli O157:H7 and characteristics of the cattle or conditions of the feedlot pen. J. Food Prot. 64:1899-1903. Watts, P.J., M. Jones, S.C. Lott, R.W. Tucker and R.J. Smith. 1994. Feedlot odor emissions following heavy rainfall. ASABE 37:629-636. Wilson, C.B., G.E. Erickson, C.N. Macken and T.J. Klopfenstein. 2004. Impact of cleaning frequency on nitrogen balance in open feedlot pens. In 2004 Nebraska beef cattle report. pg. 72-73. University of Nebraska-Lincoln, Lincoln, Neb. Ziemer, C.J., J.M., Bonner, D. Cole, J. Vinjé, V. Constantini, S. Goyal, M. Gramer, R. Mackie, X.J. Meng, G. Meyers and L.J. Saif. 2010. Fate and transport of zoonotic, bacterial, viral, and parasitic pathogen during swine manure treatment, storage, and land application. J. Anim. Sci. 88:E84-E94.